Note: Discussions work best in a circle. You will have to work much harder to create discussion in a jug-to-mug classroom style setup. Sit in a Circle! Joel is only 3 chapters. Put your lesson pamphlet away this week and teach from the Bible. Read through Joel together. Here are some thoughts and questions to get the conversation started! In this passage there is one task given, one thing asked of them - to pass the story on. First they must listen to it, then they must tell it and listen to their children tell it. What are the benefits of passing a story down? What are the stories we Adventists pass down from generation to generation? Even horror stories, in hindsight, can be told in a way to bring glory to God and to show His presence and power. How do you feel about this? Is this what Joel is doing? The story becomes personal. How does Joel help the people take the story seriously? What does he ask them to do personally and corporately? What will be accomplished by sackcloth, wailing, fasting, worship and prayer? In Chapter 2, Joel switches viewpoints. 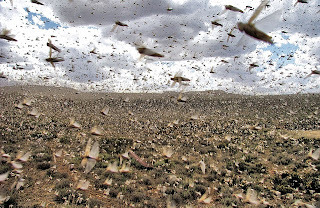 Chapter 1 showed the earthly side of God's people dealing with a plague of locusts. Chapter 2 shows it from the view of God and his spiritual forces. It shows that events we see as "natural" have hidden forces behind them. And it shows that God has a plan, largely unseen by humans, which is unfolding and will burst through the curtain between worlds. As you Read 2:1-11, Imagine a plague of locusts, sweeping down from the north. Clouds of black formed by millions and millions of whirring, whizzing flying creatures coming in force directly at your home, your crops, your cities and your very life. 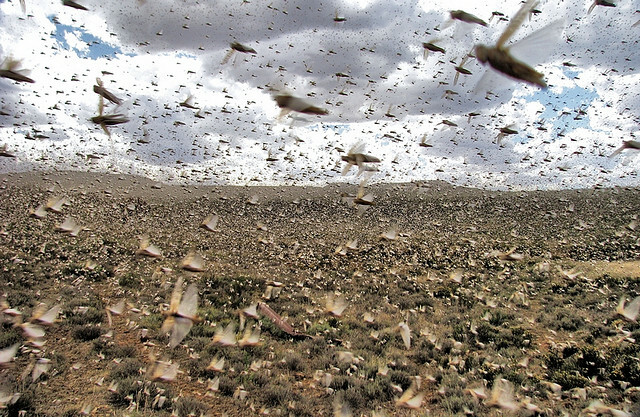 How does this picture of a locust attack make you feel? Do you want it to end? What would you do to bring such a plague to an end? What could you possibly do? There is only one thing! This is Joel's call, on behalf of the Lord, to God's people. What does he ask them to do in this time of trouble? How is it similar to the call in 1:13-20? The first time these were the words of the Prophet. This time they are the words of the Lord. White repetition is a great teacher, what about the escalation of "who said it" to the people? What impact do you think it had to know these were God's words - His desire for his people? If you were alive in their day, what would you have done? How does this verse impact you after living everything before it? What is different about this verse from any before it? Joel 2:18 marks a transition in the book of Joel. Part 1 is finished - the tough part, the agonizing part - the suffering is finished. God's Mercy has been aroused. He has heard their prayers, seen their humility, received their worship and accepted their repentance. This verse is the first time in Joel that Hebrew narrative tense is used. Rather than the message coming from Joel (as in chapter 1) or God (in 2:1-17), we now meet the Narrator, the epic Storyteller - the teller of God's story through the lives of His people - declaring the emotion and response of the Lord. "Then the Lord became jealous for his land and had pity on his people." Read the rest of chapter 2 as a group (Joel 2:18-32). Take turns reading a verse each around the circle. Keep the momentum moving quickly. Feel the joy embedded in this part of the message from Joel. When you get to the following verses, read them as an entire group: 25, 32. Could you feel it building? Was it exciting? How would those verses have impacted you without the rest of chapters 1 and 2? Why is it important to tell the story of our past to our children? Now that Joel has given an explanation of the locust plague which had devastated the people of God and the people have done what they can (worship) to stop it, the rest of Joel expands the picture - just as God will deal with the locust invaders, so He will deal with human nations that invade, destroy and dishonor Him and His people. Chapter 3 tells the story of God's plans for Judah and those who persecute her. If you have time, read Joel 3 around the circle, a few verses each. If you don't have time, ask people to read it/skim it quietly. Joel 3 is exciting! God has plans for His people. What stands out to you most in this chapter? What does this chapter make you want to do? How did this chapter give you hope and help for your own future? Read 3:13,14 - How does this explain the way God sees the world around us? As a Sabbath School class, one of our four tasks is to serve the community around our church. What are we doing to reach the multitudes in the valley of decision? How are we mingling with them? How are we serving them? How are we drawing them to follow Christ through our care for them? Joel is a short but powerful book. I hope you saw that even in our struggles God is present and longing for us to remember Him. He loves us. He has a plan. And that plan includes you and I worshiping Him and making a difference to the multitudes who are in the valley of decision. May He bless our Sabbath School as we commit ourselves to worshiping Him and ministering to the community in which we live.